7-month FTS.... a little late again! I also uploaded a new video in a post on the thread. New FTS for the four-month mark... now with free Acro! Man this tank has come a long way in two months! First time poster and first time Saltwater aquarium owner here. I've kept a few small (20g) freshwater aquariums in the past and have always wanted a saltwater/reef aquarium, so here we are. My my wife got me the Fluval EVO 13.5g (I know, another first timer with a Fluval Evo!) for m bday about two weeks ago. So naturally I began doing some research and when the tank was delivered, I immediately went to my LFS to get sand, rock, and water. 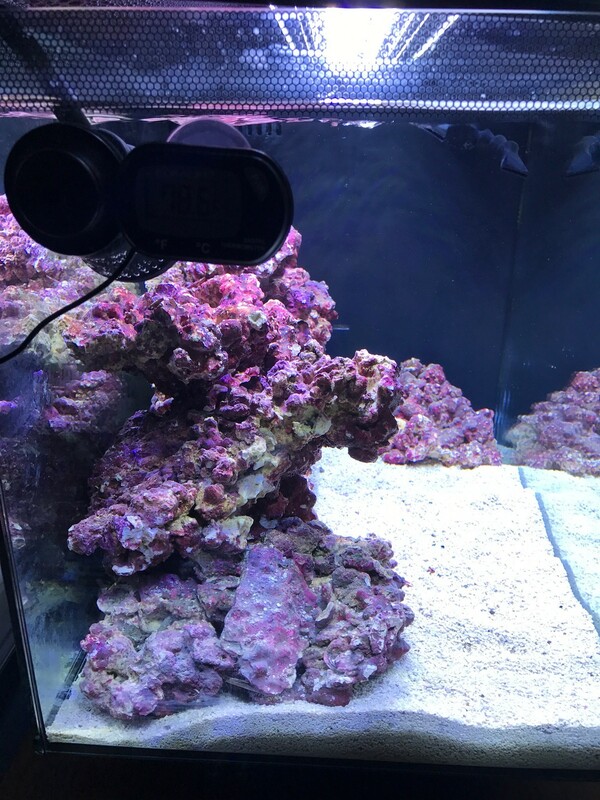 I clearly didn't do enough research as I'm pretty sure I overpaid for Real Reef Rock cured live rock, CaribSea Arag-Alive live sand, NutriSeawater prepared saltwater. They told me it would cycle the tank faster and I believe it has(?). I set up on Friday 3/17, tested the water on Sunday 3/19 and found ammonia was at 0.2, nitrite at 0.5 and nitrate at 5. I tested again last night (3/21) and both ammonia and nitrite were both zero, and nitrate held steady at 5 ppm. Is it possible for the tank to have cycled that quickly just using these products? I purchased the fluval PS2 skimmer that fits in chamber 1 on the tank. I've seen some negative reviews/comments of this product but will reserve judgement until I have some live stock in the aquarium. I also added a Hydor Koralia 425 for added circulation. I am currently using the stock filter sponge and media but would to upgrade to a DIY media basket and some filter media. If anyone have the dimensions for and egg crate media basket in chamber 2 and recommendations on media, it would be greatly appreciated. Gonna roll with the stock LED light until I see a need to do otherwise. I think I am seeing my first algae bloom on the rocks. Its golden brown. I plan on adding a clownfish or two, some hermit crabs, shrimp, snails, and coral. I actually more excited about the corals than anything else at this point. Anyways, here are some shots of the tank. I am still toying with the rock/aquascape. I think I might have a little too much rock in there that is crowding the space. Would appreciate feedback or suggestions. Front and side view below. Looks good, way to go man! 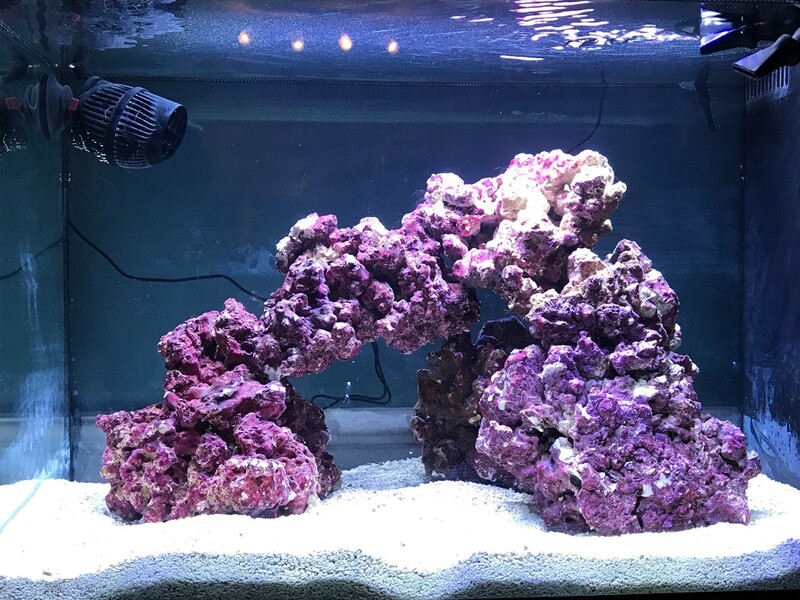 The purple coralline algae looks like it is fully in. I suppose it is possible that you skipped the bulk of the cycle if everything you put in the tank was already cycled and still "fresh". Whatever it was, the tank looks great! I would wait a while longer to make sure your parameters are stable before adding any livestock. I can't speak to the skimmer, but as far as media is concerned, Purigen and ChemiPure are the standards. Give them a try. I would add ammonia to the to the tank. 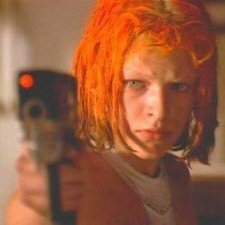 If it reads zero ammonia the next day, it's cycled. If not, it hasn't completed yet. I am wary of all Fluval Sea products except for the tanks, as (in my experience) many of these mega-brands don't really have the knowledge of what people want in the hobby. For a media basket, go with an inTank. I'd upgrade the light to a Nanobox Mini Tide, too. Thanks for the input. 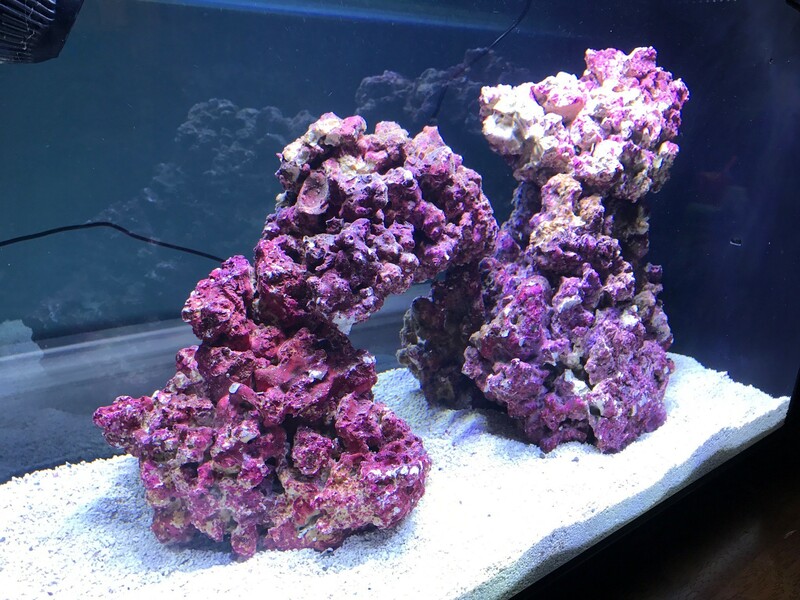 The pink/purple "coralline" look is the artificial coloration given to the Real Reef Rock. Some people dont like it because its too purple, but I don't really mind it. It definitely had some extra "life" on it in the tube at the fish store. No hitch hikers though. I tried moving the scape off the back glass last night and realized how reliant it was on the glass for support. So I completely remodeled. New photos below. Unfortunately during the remodel I found some mud stuck in one of the rocks that I missed when rinsing them. Now there are little bits in the sand. Looks like be vacuuming and changing out some water tomorrow. I also tested the water parameters again and ammonia (0), nitrite (0), and nitrate (5), were all the same as on Tuesday. The golden/brown algae on the rocks is spreading pretty quick. I'm gonna pick up some snails and a hermit crab or two from the LFS this weekend to begin cleaning up. Any recommendations on hardworking algae busting snails? I like the new rockscape!! I haven't tried them myself, but everyone on here seems to really like Trochus snails. I have Astreas, which have worked fine for me, although some people complain that they don't right themselves well if they fall over. Great work on the new scape! Looks awesome and maintenance won't be a PITA. Dwarf Ceriths are great CUC members, especially for diatoms. Nerite snails are alright, but they absolutely will climb out of the tank and die slowly if you don't save them. Nassarius snails are a must have as soon as you start feeding the tank, they are excellent scavengers and sand stirrers. Small "reef safe" hermits like the Blue Leg help with algae control, but make sure to have extra vacant shells in the tank too or they will devour snails and steal their shells. The new scape looks great. Welcome to NR ask as many questions as you like the members here love to help newbies with their tanks. If possible follow RIP advice on added ammonia and testing. Just two weeks in sounds like it may need a bit more time. Testing how well the tank processes ammonia is one of the best ways to know where your cycle is. My water parameters have remained the same all week, so I added some ammonia to the water today as suggested by RIP. Tested the water about 15-20 mins after adding the ammonia and it was at approximately 2 ppm, possibly a little higher. The Red Sea test kit I have only has the color scale up 2 ppm but my sample had a little blue in it compare to the shade of green on the scale sheet. I'm starting to think it never even began to cycle. We have our first resident! Discovered a small bristle worm crawling out of one the rocks this afternoon. That's one expensive worm habitat. Unfortunately the ammonia levels have not significantly decreased since the dosing yesterday. The nitrites did not increase significantly, but nitrates did got from 5 to 10. Going to add some bottled bacteria to help move things along. Bottled bacteria is a great idea. Bristleworms are great for Reef Tanks!! Yeah that's what I have read. My wife immediately wanted to kill it! Added a bottle of Bio-Spira last night. This evening the ammonia is reading 0, nitrites 0.1, and nitrates are between the 20 and 50 shade of hot pink on my Red Sea test kit, we'll call it 35. I'm wondering if I should change out some water to get the nitrates in check or just leave it alone until the nitrites are down to zero also. I've seen conflicting opinions on this when researching. Also, is it necessary to add more ammonia to keep feeding the bacteria now that I've added Bio-Spira to the tank? Or is it safe to add some live stock? Was thinking about adding some snails to begin working on the diatom bloom. Found another hitchhiker(s) last night. There is what looks like a decent sized amphipod in the first chamber of the AIO and tons of little ones crawling all over the glass. Go ahead and add a few snails, see how they do, and continue keeping an eye on parameters. Thanks. So hold off on the water change for now? My water has finally stabilized, so we went to the LFS to get our first finned resident. Unfortunately all their Oscellaris a Clowns were in QT until April 10. We reserved two for pick up when they make it through QT with a clean bill of health. The guy at the store was trying hard to sell us a Percula pair. I was really trying hard to politely decline because that isn't what we wanted, but he was pretty persistent. Another employee popped over and said our tank was too small. Thank you fish store lady! Anyways, we did pick up a small CUC (1 turbo, 2 nassarius, and 2 hermits). The turbo is going through the diatoms like a buzz saw. Im about to give up on the skimmer. It's becoming increasingly loud and I believe it's the culprit for the micro bubble invasion. I'm keeping it off until we get fish and may just remove it entirely anyways. Anyone have any tips on the micro bubble issue? Fashioned a DIY two shelf media basket for chamber 1. Filter floss on shelf 1, purigen on shelf 2, and ChemiPure Elite in the bottom. I wasnt sure if letting the bag of ChemiPure sit on the bottom of the chamber would be as effective, so I hung it from the second shelf to get better flow around it. Removed the skimmer. Its just too loud and im not even sure its really doing anything at this point. May re-implement in chamber 2 down the line if needed. Also removed the stock sponge, carbon, and bio max cylinders from chamber 2. In the meantime, what to do with chamber 2.... any suggestions? 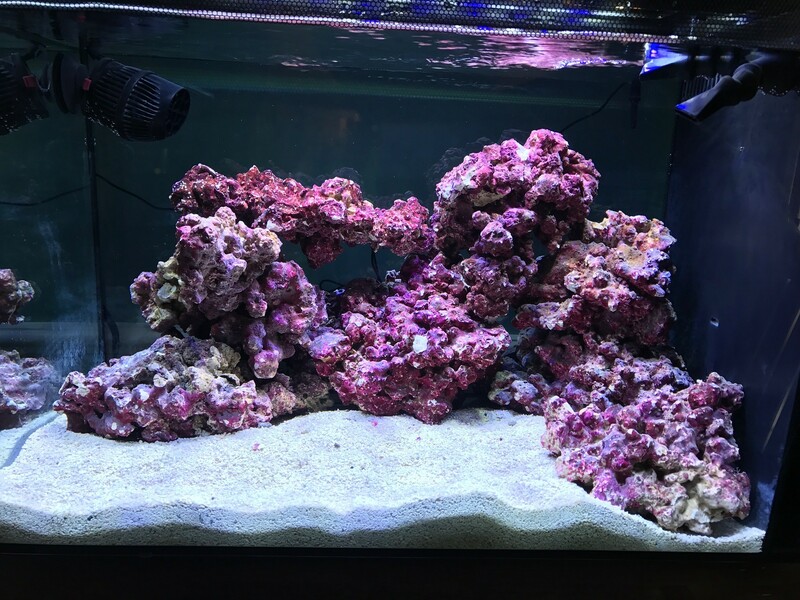 First corals scheduled to arrive on Friday. I picked up a chunk of Rasta Zoas and Fire and Ice Zoas from drgibbys livestock sale over in the marketplace. First fish, a pair of occerilis clowns, will be out of QT at the LFS and hopefully coming home Tuesday. Things are coming together. Really like the most recent aquascape. I think you have a winner! Love the bridge and the large pillar on the right. Looks like you have tons of room for corals. 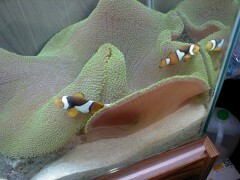 Do you know what the Clown fish look like yet? Thanks! I am sticking with this one. I even expoy'd the top rock of the tower, so it's a done deal. Yeah, just standard Occellaris with the normal banding. Nothing fancy. My wife and I actually agreed that we prefer the standard natural look as opposed to some of the fancy morphs that are available. They had about 7-8 in QT that we can choose from. All about 1.25"-2". 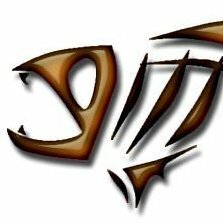 Going for fish with a darker orange color and one larger than the other so they can sort the his and her deal more quickly. Nice rock work and progress. I'm just cycling my evo 13.5 tank too. I'm also having an issue with particulate blowing around the tank. While the water itself is crystal clear there are little bits of "stuff" constantly floating and blowing around. I am hoping that using the filter floss on the water immediately entering the AIO chambers will eventually filter this debris out of the water. I am planning on a small water change this evening and will try siphoning out the bottom of each chamber to help with this also. 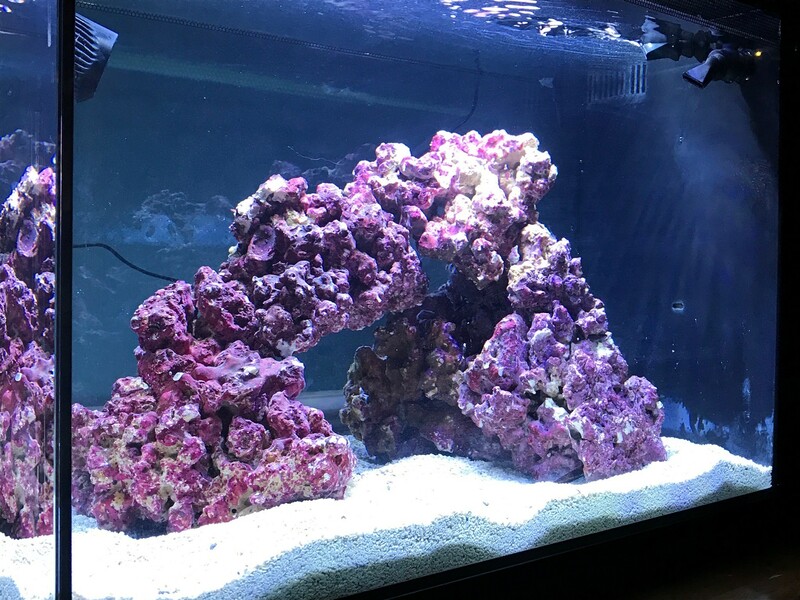 I am excited to get my first corals in the tank tomorrow. Also, a little nervous since I've never dipped anything and tried to attach it to LR. But I got my Bayer, superglue, and epoxy! Added my first corals yesterday. Rasta and Fire and Ice Zoas from drgibbys livestock sale and an Orange Ricordea from the LFS. All but one Rasta polyp has opened. The Fire and Ice is a little slower to open. I glued the foot of the Ricordea directly to a plug and stuck him in the sand for the time being until I can figure out where I want him permanently. Sorry for the poor photo quality my iPhone has trouble with the actinic lighting. Congrats on the new arrivals!! Try the Snapseed photo editing app, it really helps. Been awile since my last update. Had a busy week over here for the family and the tank. My wife was out of town for a conference, so it was just me and my son all week. We took the opportunity presented by the lack of adult supervision to spend some money on the tank! Received four new corals from Supreme Corals on Wednesday. I cant say enough about the owner Ben. 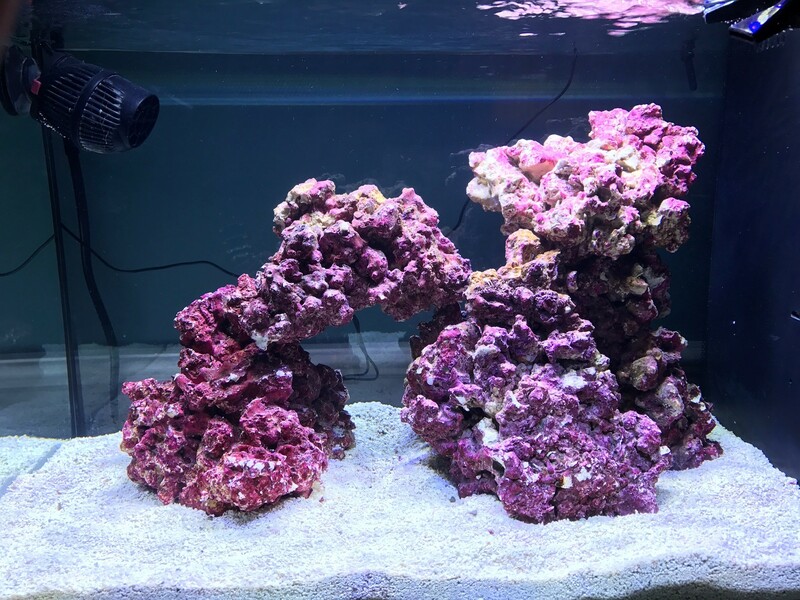 Great looking coral, great prices, a local company, and a great experience overall. We added a raptors peace favia, toxic green leptoseris, sympodium, and purple palys (these were included as a freebie). The sympodium polyps are refusing to open after I cut the bottom of the plug off this morning to mount it. Will post a picture when they stop being so moody. We also added two Oscellaris Clowns, Pennywise and Capt. Spaulding. They are getting along well and are well on their way to becoming a pair. The smaller of the two has been doing the submission shuffle regularly and the larger one has become accepting of his presence. They spend much of their time together and sleep together in the same spot at night. She is a big bully during feeding time though. Man, this file size limit on photos is a pain! One more post to come.